As a NYC home buyer who may have just heard about the concept of a broker commission rebate, you are likely asking yourself: are NYC broker commission rebates legal? Fortunately, buyer broker commission rebates in NYC are fully legal. In addition, broker commission rebates are not generally considered to be taxable income. What do I need to know about the legality of broker commission rebates in NYC? 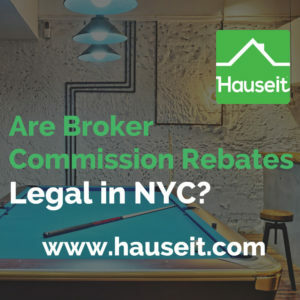 Where in the law does it say that NYC broker commission rebates are legal? How are lawmakers in New York encouraging broker commission rebates in NYC? What is a NYC broker commission rebate? Who pays for a NYC buyer agent commission rebate? Where can I read the NY Attorney General’s letter regarding the legality of broker commission rebates? Will I save more money on my purchase by being unrepresented than by requesting a rebate? Are NYC broker commission rebates available for renters as well? Will I be discriminated against by listing agents for receiving a NYC broker commission rebate? How do I request a NYC broker commission rebate? Why were buyer broker commission rebates legalized in New York? Why should a NYC home buyer work with a buyer’s agent? Broker commission rebates in NYC are 100% legal, despite what you may hear from traditional buyer’s agents and NYC listing agents. New York is one of 40 states where receiving a broker commission rebate is permissible and encouraged by law. Specifically in New York City, broker commission rebates are 100% legal as per the Real Property Law which governs the state’s property market. Real estate commission rebates are actively promoted by New York’s Attorney General and Antitrust Division as a means of increasing competition in the real estate industry and ultimately reducing overall real estate commissions when buying and selling real estate in New York City. Broker commission rebates are rare in NYC because they are vehemently opposed by traditional real estate agents who have been earning full commission for the past three decades. If you ask an old school agent about buyer agent commission rebates, he or she will likely first say that rebates are illegal. If you point out that rebates are actually legal, a typical broker will be highly offended and simply refuse to offer a rebate. Because the topic of broker commission rebates is a highly divisive subject among brokers in NYC, it’s especially important to make sure that any rebate you are receiving from your buyer’s agent is discreet. After all, how can you expect a veteran listing agent to treat your offer fairly vs. other offers if the agent is offended that you will be taking away some of his or her commission on the deal? Will a seller be open to negotiating as much on the price if they realize that they are basically paying you commission? How much are buyer closing costs in NYC? Estimate your buyer closing costs in NYC using Hauseit’s interactive closing cost calculator for buyers. Pro Tip: Are you buying investment property in NYC? If so, check out our detailed rental property calculator to figure out your anticipated cap rate and cash and cash return. Pro Tip: Curious about the differences between condos and co-ops? Read our Condo vs. Co-op Comparison for NYC. As a buyer in NYC, you may have heard that the services of a so called ‘buyer’s agent’ are free. But you may be asking: if my buyer’s agent is free, who pays the bill? And what is a New York City real estate commission rebate? How does a real estate rebate save me money? A NYC broker commission rebate is a cash rebate offered to a home buyer from his or her NYC buyer’s agent as an incentive for working with them on the home purchase. A buyer agent commission rebate is simply a much larger closing gift versus your typical bottle of wine or box of chocolates that a buyer’s agent offers his or her client at closing! A seller hires a NYC listing agent and signs a 6% Exclusive Right to Sell Listing Agreement. In signing this contract, the seller agrees to pay a total of 6% commission when the property sells. If you as the buyer are unrepresented and have no buyer’s agent, the seller pays the entire 6% commission to the listing agent. If you are working with a buyer’s agent, the listing agent will split the commission equally so that the seller pays 3% commission to the listing agent and 3% commission to your buyer’s agent. The key takeaway here is that sellers typically pay the same amount of commission regardless of whether a buyer’s agent is involved in your deal alongside the listing agent. If you are unrepresented, the listing agent will simply collect both sides of the commission and the seller will not save any money. Because the seller pays the commission bill for your buyer’s agent and you won’t achieve a lower sale price by being unrepresented, hiring a buyer’s agent is a no brainer. You hire a buyer’s agent to help you with your purchase. Your buyer’s agent offers several services to help streamline the overall deal process. Now here’s where the real estate commission rebate concept comes into play. If you hired a traditional buyer’s agent who does not offer a rebate, your agent will collect his or her commission check at closing and walk away. If you are lucky, your traditional buyer’s agent will buy you a box of chocolates or a bottle of wine as a token of gratitude for you sending them a deal worth tens of thousands of dollars. On the other hand, if you requested a real estate commission rebate your buyer’s agent will write you a check at closing for a portion of the commission he or she earned on the deal. While it’s certainly not permissible for a broker or salesperson to split a commission with an unlicensed party, brokers and salespeople are fully permitted and encouraged by the law to offer commission rebates (cash or otherwise) to their actual customers (buyers and renters). The average New York City real estate commission rate of 5-6%, which includes the buyer’s agent commission, is fully paid by the seller in NYC. When a buyer is unrepresented, the full 6% commission is pocketed by the listing agent. If a buyer has representation, then the 6% commission is generally split equally between the listing agent and buyer’s agent. Because of the high median purchase price in the city, real estate commission rebates in NYC can end up being $30,000 or more. A NYC real estate commission rebate can significantly reduce your NYC buyer closing costs. If you are buying a property above $1 million, a NYC real estate commission rebate will usually cover your entire NYC mansion tax bill. Better yet, real estate commission rebates in NYC are completely legal and generally considered to be non-taxable income. Are buyer closing costs different for condo and co-op apartments in NYC? Read Hauseit’s Condo vs. Co-op Closing Cost Comparison for NYC. When searching for a property in NYC, home buyers are presented with two options. They can either choose to search on their own and then work directly with the listing agent for a particular property. Alternatively, NYC home buyers can work with a buyer’s agent throughout the search. Typical NYC buyer agent responsibilities include everything from the initial search through to submitting offers, negotiating, preparing a NYC co-op board package and guiding the overall deal to closing. Receive a NYC Broker Commission Rebate – Requesting a NYC buyer agent commission rebate is an automatic way to save money when buying in NYC. The best part about receiving a commission rebate is that it’s an automatic discount which is on top of whatever other pricing concessions you negotiate with the seller. If you work directly with a listing agent, you are simply handing all of the commission to the listing agent without receiving any direct, monetary savings or benefit yourself. Requesting a NYC broker commission rebate will also save you from the risks of working directly with a listing agent under a dual agency arrangement. Buyer’s Agent Representation in NYC is Free – Buyers don’t pay anything to have professional representation. Sellers in NYC pay 100% of all real estate commissions, including the percentage commission which is paid to a buyer’s agent. In addition, there’s almost always zero benefit to an unrepresented buyer in terms of getting a lower sale price by being unrepresented. This is because virtually all NYC home sellers sign an exclusive right to sell listing agreement with his/her listing agent obligating the seller to pay 6% commission no matter what. So if you are unrepresented, the full commission just goes to the listing agent as opposed to being split with your buyer’s agent. Because of the way NYC commissions are structured, unrepresented buyers almost never benefit from a lower purchase price simply because they are unrepresented. This is because sellers typically agree to pay the same 6% in real estate commissions even if no buyer’s agent is involved in the deal. The only thing that’s up for debate is how that 6% will be split. It will either be 100% kept by the listing agent (if the buyer is unrepresented) or shared 50/50 with the buyer’s agent. Even if a listing agent claims that the seller will pay less commission if you are unrepresented, there is no way to prove how much less commission the seller will pay. This is because a seller’s commission structure is private and only known by the seller and listing agent. There’s also no way for you to guarantee that any seller commission savings will be passed onto you in the form of a lower purchase price. Because a seller’s commission structure in NYC is not openly disclosed, it’s impossible for you as the buyer to measure the size of the alleged discount you’d receive as an unrepresented buyer and ensure that you are actually receiving it. On top of that, a typical NYC real estate commission rebate will almost always dwarf the amount of potential (unquantifiable) savings you’d pocket by submitting an offer as an unrepresented buyer. Why chase a theoretical, unquantifiable discount by being unrepresented when you can lock in an automatic and quantifiable discount by requesting a NYC broker commission rebate? Given the low inventory of rentals in NYC and fierce competition for apartments, it’s definitely less common to receive a broker fee rebate as a renter in New York City. There is less room for negotiation with a rental agent because he or she likely has a line of potential renters who won’t ask for a rebate. Even though rental broker fees are highly detested and perceived as being high by renters, the reality is that after the commission split with his or her brokerage, brokers don’t actually earn that much money from rentals. Commission rebates may also be unofficially not permitted by their brokerage. So there are many forces working against renters in NYC receiving any form of rental broker fee rebate. Pro Tip: Save money on your next rental by requesting a Hauseit Rental Broker Fee Rebate. Broker commission rebates in NYC are highly controversial among established listing agents in NYC. While it’s illegal for a broker to discriminate against innovative listing brokers and buyer’s agents who work for low commissions or offer rebates, the reality is that there’s no way to prove that a listing agent is treating you differently. Even if you were able to somehow prove that a listing agent mistreated you because you were receiving a buyer broker rebate, there would be no way to change the fact that another buyer walked away with your dream home. After all, broker commission rebates are a threat to the status quo and the livelihood of thousands of established agents in NYC who haven’t had to offer discounts in the past. Wouldn’t it be understandable for a traditional listing agent to harbor resentment against you and favor another buyer if they realize that you are working with a broker who openly offers rebates and is out to disrupt the industry? The only way to safely secure a NYC buyer agent commission rebate without risking your deal altogether is to receive a discreet rebate from a traditional broker who doesn’t openly advertise rebates online. 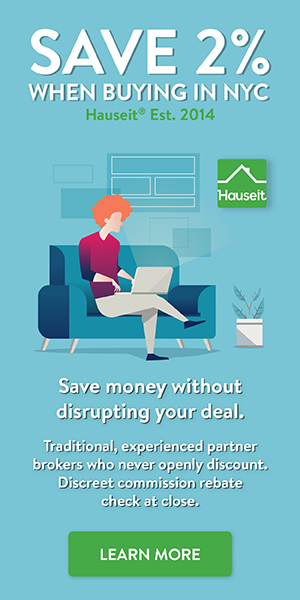 All Hauseit partner brokers are independent, full service, brand name traditional real estate firms that never openly discount or tarnish their reputations in any way. As a result, the discreet commission rebate check you’ll receive post closing will be our little secret! First, a word of advice before you request a NYC real estate commission rebate. There are over 50,000 buyer’s agents in NYC, and most of them have little or no recent deal experience. Just like in any other industry, there are seasoned professionals as well as amateurs all vying for your business. Having an experienced buyer’s agent can be a tremendous asset to your deal, but partnering with an inexperienced or unprofessional buyer’s agent can put your entire deal at risk. You can easily lose much more than the amount of your rebate in the form of poor buyer agent advice which may cause you to overpay or lose your dream home altogether. Buyer broker commission rebates were legalized in New York as a result of the NY Attorney General’s investigation into the lack of competition in the New York real estate brokerage market. The investigation was triggered as a response to NYC commission rates remaining steadfast at 5-6% despite falling commission rates around the country and significantly lower commissions in London than in NYC. Under the traditional NYC commission structure, sellers agree to pay 6% in total commissions no matter what. This arrangement effectively encourages the use of two agents in every deal: a listing agent and a buyer’s agent. As a result, a buyer effectively for the services of a buyer’s broker even if he/she does not choose to be represented. The Attorney General’s office concluded that the quickest way to reduce real estate commissions in NYC was to permit buyer broker commission rebates. Legalizing rebates has a much quicker impact in reducing transaction costs compared to trying to change the traditional seller commission structure which has been in NYC for decades and won’t disappear anytime soon. Where can I read the letter that NY's Attorney General wrote about the legality of commission rebates?